Preheat oven to 325F. Use aluminum foil or parchment paper to line a 13 x 9 baking pan. Coat the liner with vegetable spray. Set the pan aside. In a medium-size mixing bowl using an electric mixer on low speed, cream together butter, honey, brown sugar, and vanilla extract. Add flour, baking soda, and oats. Stir until well-mixed. The mixture will form large, soft clumps. (See more about using oatmeal in cookies.) Stir in dried fruit and nuts. Press mixture into the prepared baking pan. Bake for 18-20 until edges begin to turn brown. Remove the pan from oven. Use a small loaf pan or other smooth-bottomed dish to press the bars flat. Allow the cookies to cool completely. Use a sharp kitchen knife or a pizza cutter to cut into 6 rows of 4 or any size you wish. Store the bar cookies in a sealed container at room temperature for up to a week. You can also freeze them to serve later. You can substitute all or part of the all-purpose flour with whole wheat flour. It’s best to dice the dried fruit into small pieces, no matter what types or combinations you choose to use. This way the cookies will cut more cleanly. If you like crunchier bar cookies rather than softer bar cookies, add an extra ¼ - ½ cup flour to the recipe and bake cookies for 20-22 minutes rather than 18-20 minutes. See more recipe ideas on our Oatmeal Cookies Pinterest board. 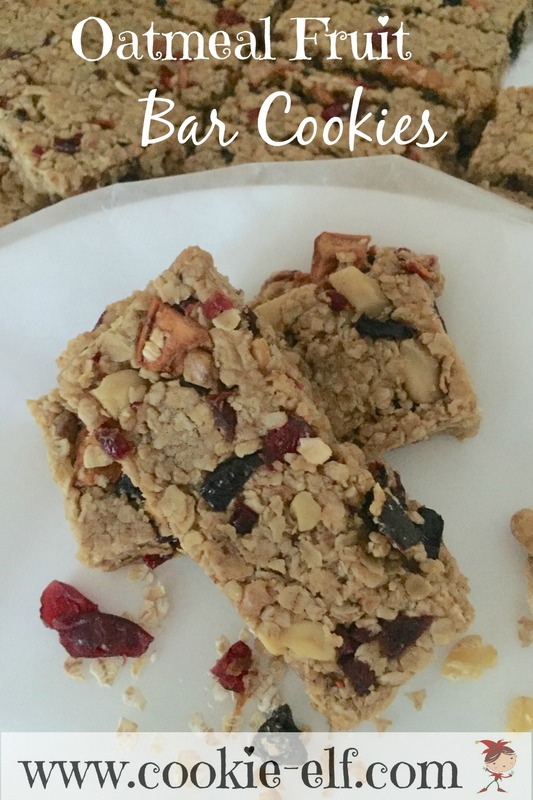 Cherry Oatmeal Bar Cookies Recipe: just 4 ingredients!